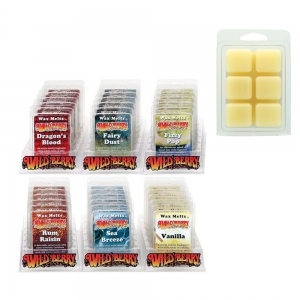 3 x 2 oz packs of Wild Berry Wax Melts of one fragrance. One 2 oz pack is equivalent to more than 3 standard tarts. Each pack has 6 cubes - each cube is equivalent to more than half a standard tart. Now available in 12 gorgeous fragrances - Carnival, Dragon's Blood, Egyptian Musk, Fairy Dust, Fizzy Pop, Pumpkin Spice, Rum Raisin, Sea Breeze, Shooting Star, Sweet Pea, Vanilla and Wild Honey.